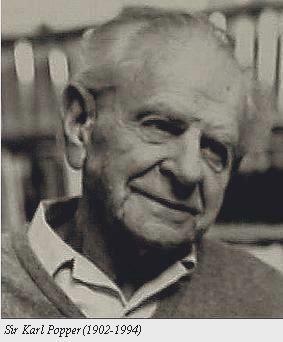 Sir Karl Popper was one of the best known Philosophers of Science and is best known in scientific circles for his “Demarcation of Science” that is, his attempts to define or “demarcate” what science is and what science is not. You can read about him more extensively in an encyclopedia if you wish, but this will be a short review of what Popper actually wrote in chronological order. Below, we shall see that Popper clearly described ‘law-based’ science, that he excluded evolutionary biology from this program and called it unscientific and ‘metaphysical,’ that he later recanted about the scientific nature of it and then provided a different program for testing what he calls the ‘historical sciences’ of which Ev Bio is one. Popper described science as that which is controlled by natural law (Meyer calls this ‘nomological’, or law-based science) and it is only later that he spoke of ‘historical’ science and allowed evolutionary biology to be classified as such. Notice his clear example below. 12. Causality, Explanation, and the Deduction of Predictions. To give a causal explanation of an event means to deduce a statement which describes it, using as premises of the deduction one or more universal laws, together with certain singular statements, the initial conditions. For example, we can say that we have given a causal explanation of the breaking of a certain piece of thread if we have found that the thread has a tensile strength of 1 lb. and that a weight of 2 lbs. was put on it. If we analyse this causal explanation we shall find several constituent parts. On the one hand there is the hypothesis: ‘Whenever a thread is loaded with a weight exceeding that which characterizes the tensile strength of the thread, then it will break’; a statement which has the character of a universal law of nature. On the other hand we have singular statements (in this case two) which apply only to the specific event in question: ‘The weight characteristic for this thread is 1 lb.’, and ‘The weight put on this thread was 2 lbs.’. We have thus two different kinds of statement, both of which are necessary ingredients of a complete causal explanation. They are (1) universal statements, i.e. hypotheses of the character of natural laws, and (2) singular statements, which apply to the specific event in question and which I shall call ‘initial conditions’. It is from universal statements in conjunction with initial conditions that we deduce the singular statement, ‘This thread will break’. We call this statement a specific or singular prediction. Karl Popper, Unended Quest (London: Routledge, 2002) 194, Questia, 4 Sept. 2007 . Originally published in 1976. I have come to the conclusion that Darwinism is not a testable scientific theory, but a metaphysical research programme–a possible framework for testable scientific theories. As for Darwinian theory itself, I must now explain that I am using the term “Darwinism” for the modern forms of this theory, called by various names, such as “neo-Darwinism” or (by Julian Huxley) “The Modern Synthesis”. It consists essentially of the following assumptions or conjectures, to which I will refer later. (1) The great variety of the forms of life on earth originates from very few forms, perhaps even from a single organism: there is an evolutionary tree, an evolutionary history. (2) There is an evolutionary theory which explains this. It consists in the main of the following hypotheses. (a) Heredity: the offspring reproduce the parent organisms fairly faithfully. (b) Variation: there are (perhaps among others) “small” variations. The most important of these are the “accidental” and hereditary mutations. (c) Natural selection: there are various mechanisms by which not only the variations but the whole hereditary material is controlled by elimination. Among them are mechanisms which allow only “small” mutations to spread; “big” mutations (“hopeful monsters”) are as a rule lethal, and thus eliminated. Assumptions (1) and (2) are, I think, essential to Darwinism (together with some assumptions about a changing environment endowed with some regularities). The following point (3) is a reflection of mine on point (2). (3) It will be seen that there is a close analogy between the “conservative” principles (a) and (d) and what I have called dogmatic thinking; and likewise between (b) and (c), and what I have called critical thinking. I now wish to give some reasons why I regard Darwinism as metaphysical, and as a research programme. It is metaphysical because it is not testable. One might think that it is. It seems to assert that, if ever on some planet we find life which satisfies conditions (a) and (b), then (c) will come into play and bring about in time a rich variety of distinct forms. Darwinism, however, does not assert as much as this. For assume that we find life on Mars consisting of exactly three species of bacteria with a genetic outfit similar to that of three terrestrial species. Is Darwinism refuted? By no means. We shall say that these three species were the only forms among the many mutants which were sufficiently well adjusted to survive. And we shall say the same if there is only one species (or none). Thus Darwinism does not really predict the evolution of variety. It therefore cannot really explain it. At best, it can predict the evolution of variety under “favourable conditions”. But it is hardly possible to describe in general terms what favourable conditions are-except that, in their presence, a variety of forms will emerge. And yet I believe I have taken the theory almost at its best–almost in its most testable form. One might say that it “almost predicts” a great variety of forms of life. 283 In other fields, its predictive or explanatory power is still more disappointing. Take “adaptation”. At first sight natural selection appears to explain it, and in a way it does; but hardly in a scientific way. To say that a species now living is adapted to its environment is, in fact, almost tautological. Now to the degree that Darwinism creates the same impression, it is not so very much better than the theistic view of adaptation; it is therefore important to show that Darwinism is not a scientific theory, but metaphysical. But its value for science as a metaphysical research programme is very great, especially if it is admitted that it may be criticized, and improved upon. Natural Selection and the Emergence of Mind, Dialectica 32:339-355, 1978. See pp. 344-346. POPPER, Karl, 1980. Evolution. New Scientist 87(1215):611. 1. To defend the scientific character of the theory of evolution, and of palaeontology. I fully support this purpose, and this letter will be almost exclusively devoted to the defence of the theory of evolution. As to (2), I find this uninteresting and I shall not waste your space and my time in defending myself against what are in my opinion hardly excusable misunderstandings. and wild speculations about my motives and their alleged history. Returning to (1), it does appear from your article (provided its quotation from Colin Patterson’s book – which I do not know – is not as misleading as your quotations from my book) that some people think that I have denied scientific character to the historical sciences, such as palaeontology, or the history of the evolution of life on Earth; or to say, the history of literature, or of technology, or of science. This is a mistake, and I here wish to affirm that these and other historical sciences have in my opinion scientific character: their hypotheses can in many cases be tested. It appears as if some people would think that the historical sciences are untestable because they describe unique events. However, the description of unique events can very often be tested by deriving from them testable predictions or retrodictions. Retrodiction (or postdiction, though this should not be confused with the use of the term in criticisms of parapsychological research) is the act of making a prediction about the past. This is especially useful when one wishes to test a theory whose actual predictions are too long-term to be of immediate use. One speculates about uncertain events in the more distant past so that the theory would have predicted a known event in the less distant past. This is useful in, for example, the fields of archaeology, evolutionary biology, financial analysis, forensic science, and cosmology. So for example, evolutionary scientists living around the turn of the 20th century were speculating about supposed Human Evolution and fully expecting (one could say ‘predicting’) that they would find ‘less evolved ape-men’ living in various places on earth. This is a ‘retrodiction’ because if the speculation about human evolution were true, then the theory would have predicted the situation expected by these scientists. See my ‘Ota Benga’ article below. Very simply that the Theory of Evolution and the Theory of Special Creation are BOTH classified as historical sciences. You could also classify both of them as ‘metaphysical research programmes’ as Popper did. Why do we care about all this? For several reasons. 1) Darwinists misuse the terms ‘predictions’ and ‘falsifiability’ (see http://www.talkorigins.org/faqs/comdesc/) and cite Popper as an authority on what science is and what it is not, thus giving the impression that Evolutionary Biology has the same scientific character as the type of ‘law-based’ science that Popper described. But this is misleading. Evolutionary Biology was only admitted as scientific by Popper as a ‘historical’ science and as you can see from above, the predictions used to test it are quite different from those used in law-based science. 2) Darwinists try to elevate their theory above the Theory of Special Creation (TSC), saying that their theory is scientific and TSC is not. They have managed to convince judges and school boards of this in America and as a result, the courts view any mention of Intelligent Design in the classroom as ‘religious’ and therefore prohibited. This is a travesty. Carol Cleland explained the differences between “historical” and “experimental” sciences HERE. This entry was posted on Tuesday, September 4th, 2007 at 6:09 am and is filed under Creation/Evolution, General Science. You can follow any responses to this entry through the RSS 2.0 feed. You can leave a response, or trackback from your own site. I think you are in a better position to look up the source and the text concerned and examine them, than some readers here like the undersigned who live in third world lands with very limited access to any well-stocked libraries of books and no less periodicals. I have seen this quotation mentioned time and again by the advocates of evolutionism who insist that Popper recanted from his earlier judgment that evolution is a tautology. Did he make his recantation in his last moments or in his good years however senior years while still in full and active possession of his critical faculties? I remember having sent an email to the scholar who is in charge of some section of Karl Popper’s website, asking for the text concerned and the citation source as can be read in some public library, to enable me to examine the circumstances surrounding the words and the publication containing them; but that scholar never replied to me.